Hod’s Anvil: an ugly name for an equally ugly planet, Khyrus Vythorex thought to himself as he looked at the image on the ghostlight sphere at the front of his ship’s bridge. The planet on the viewer was little more than a dull brown ball practically squatting in space, its surface punctured with the grey and gunmetal flecks of forge-complexes, cities and fortress, and its oceans were a similarly faded grey in colour. Only humans could live in a place so squalid and filthy, and it did not surprise Khyrus to learn that Hod’s Anvil was home to a population numbering in the billions. There would be no shortage of captives to drag back to the Kabal, he thought wryly. At the moment, however, his attention was fixed instead to the structure that drifted in low orbit around that squalid sphere– a rugged construction of crenellated buttresses spire-like comm towers, and several large, imposing cannons pointed aggressively out into the void. Its imaginative name was Argus-Rho 77, and it was but one of the many orbital defence stations ringing this fortress-world, and it had the power to devastate ships or, if pointed downwards, devastating entire city blocks with its deadly arsenal. Thanks to the holo-fields and mimic engines of the Talon, however, the mon-keigh aboard were completely blind to their presence, or to the proverbial dagger pressed to their throats. “Are you certain of this?” asked Arvaneq, his second in command, as he gazed at the ugly structure rotating on the viewer. Dark Angels. The name of this particular chapter of Astartes was so presumptuous that it almost made Khyrus laugh. Only the children of Commorragh truly knew of darkness: they were born in it, lived in it, fought, died, and were born again in it. The darkness would betray the mon-keigh, for it belonged only to the Drukhari. Still, his second in command had a point: not too long ago, as they were scouting Hod’s Anvil, they had uncovered a crudely-encrypted communication from the station. It was unknown who had sent the message, or who it was meant for, but it stated, quite clearly, that the Dark Angels Astartes were moving to occupy this station in the absence of its original crew. In particular, the message had noted that the Dark Angels were looking for something on Argus Rho-77, and in doing so were acting against the knowledge or permission of the other human forces defending the planet. The message also stated that the Dark Angels on the station were being led by some vaunted war-leader of theirs, a man whose experience and tactical brilliance would be vital to the Imperial war effort– a man named Azrael. 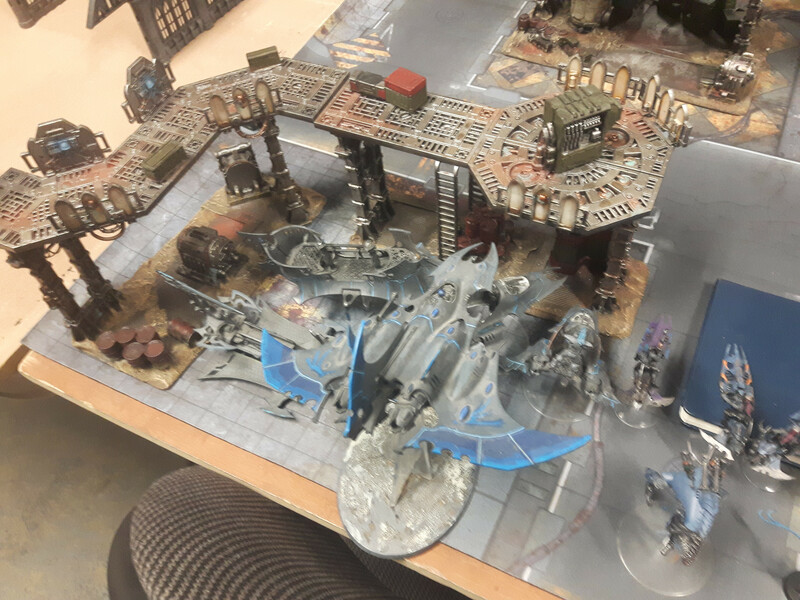 So, a about a week ago I played my first game of the Hod’s Anvil campaign. I was paired up against Phil, one of the regulars at Sword and Board. The scenarios of the first campaign round were all made to be low-scale affairs representing boarding attacks, sabotage missions and small, initial skirmishes…but Phil and I both agreed that we wanted to play something a little more large scale instead. The scenario we were playing was the Total Devastation mission from Chapter Approved 2018, with a twist: as the game would be representing a spaceborne attack on an orbital installation, as the attacker I could only start the game with units with the FLY keyword, or units riding in transports with FLY. Furthermore, while I was allowed to take units that could start the game in reserve, I was encouraged to do so with units that could feasibly arrive on the station (ie, taking things that had infiltrated or were hiding would be pushing it). My opponent, meanwhile, was limited to units with the INFANTRY, FLY or BUILDING keywords. 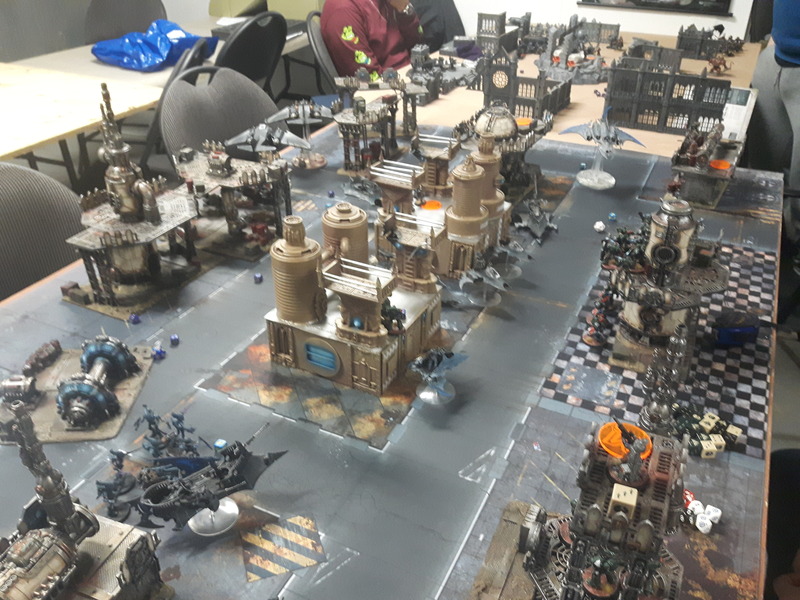 We decided to make the game fairly huge in scale at 2500 points a side, in part because Phil apparently had Terminators that he really wanted to use. I was fine by this, though this meant that I had two frenzied weeks of painting and converting to do for my army before the day of the game (sadly, I was not able to get everything done in time). For this list, I was going for as many vehicles and as many bodies as I could squeeze in from my collection. Given that this was a mission where speed would be of the essence and cover would be abundant, my usual obsession choice of Flayed Skull and Red Grief seemed like particularly strong options this time around. The general plan would be to advance up as quickly as possible, get squads onto objectives and start blowing them up, and in the meantime just try to obliterate the Dark Angels where possible with overwhelming firepower. My Wyches and Reavers in particular would go to tie up his shooty stuff, and my Taloi could hopefully deal with his Terminators or other close combat nastiness. My Haemonculus and Grotesques would be deep striking thanks to the Webway Portal stratagem, while my Mandrakes would also be coming in out of Aelindrach. Hopefully, I would overwhelm my opponents with targets, out-shoot and out-fight him, and sabotage the right objective before the timer ran out. While I figured I should have expected Hellblasters, given that they work really well with the Dark Angels’ ability to reroll 1s, I had not been expecting so many, or for there to be so many characters either. Phil had, however, been hinting well in advance that he would be bringing a flyer wing, and the presence of the three jets made me more than a little nervous. P.S. I apologize in advance, but a lot of the pictures in this batrep will be blurry and out of focus. Where possible, though, I tried to do justice to Phil’s army, which was beautifully painted by Battle Brothers Studios. For the battlefield, we made use of a lot of the walkways, gantries and platforms from the Mechanicus building sets to represent the installations on the hull of the space station. As per the scenario rules, six buildings spread across the centre and back of the battlefield had hidden objectives: each turn, I would be able to use a unit holding an objective to destroy it. I simply had to destroy the right objective, and only Phil knew which one was the right one. …and the Reavers, my Warrior Raider, and both Talos in the centre (ignore the Haemonculus, I remembered that I wasn’t allowed to deploy him just before the battle and then removed him). And yes, that is a converted Wraithlord that I’m using for a Talos. …and a unit of Scouts occupied a generator on the far left. Another squad of Intercessors was deployed close to the centre. Finally, Azrael (represented with the Dark Vengeance Captain), the Lieutenant, Apothercary, Ancient and Hellblasters all clustered around the tower in the centre). While the Drukhari ship still invisible to the station’s sensors, dozens of sleek, jagged skimmers came swooping down through the void, intent on destroying the generator-bastions lining the station’s outer hull. With the generators destroyed, the guns of this station would fall silent. As they approached, however, they saw scores of figures in green armour standing sentinel on the ramparts of the buildings. 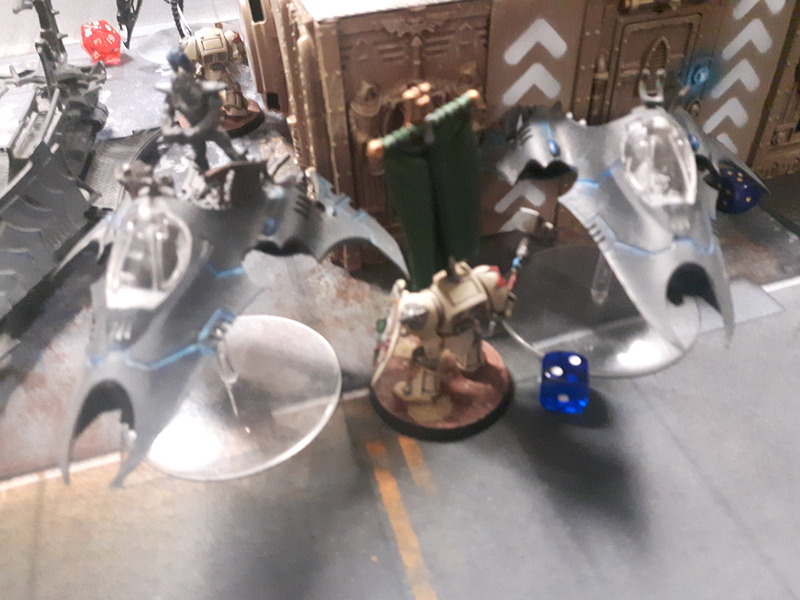 The Dark Angels were here, and had come to defend the generator stations the moment the attack had begun..
That was when the bombardment began: the Drukhari cruiser suddenly opened fire disintegrator blasts and missiles blanketed the Dark Angels positions. The Sons of the Lion had prepared their defences well. When the bombardment subsided, none of the Dark Angels had fallen. Only the Vindicare Assassin had been injured, taking two wounds from shrapnel. (18 dice rolled, and only one roll of a 6 came up. Already, my dice were showing that they had it in for me). 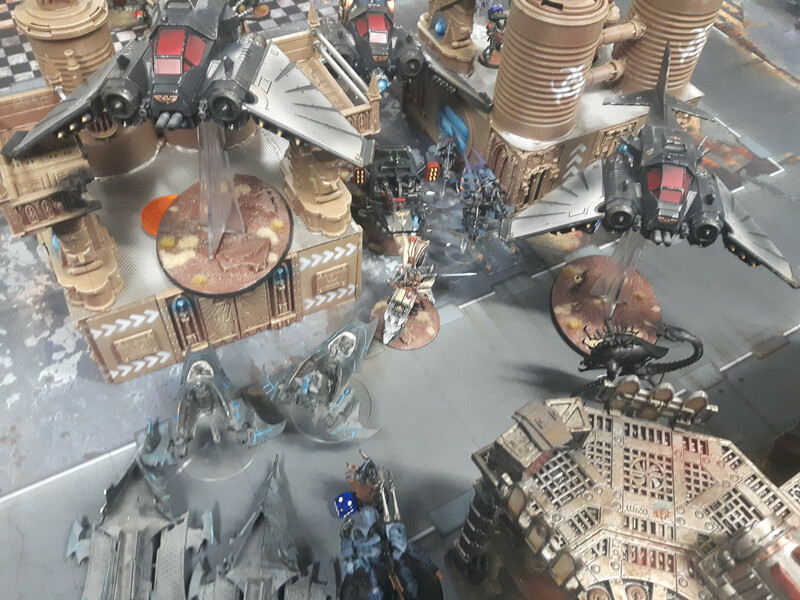 The battle began with the Ravenwing being unleashed. While the rest of the Sons of the Lion held their ground, Sammael chose that moment to use the Drukhari’s own tactics against them, swooping down on the enemy raiding force from above, using the darkness of space to mask his descent. 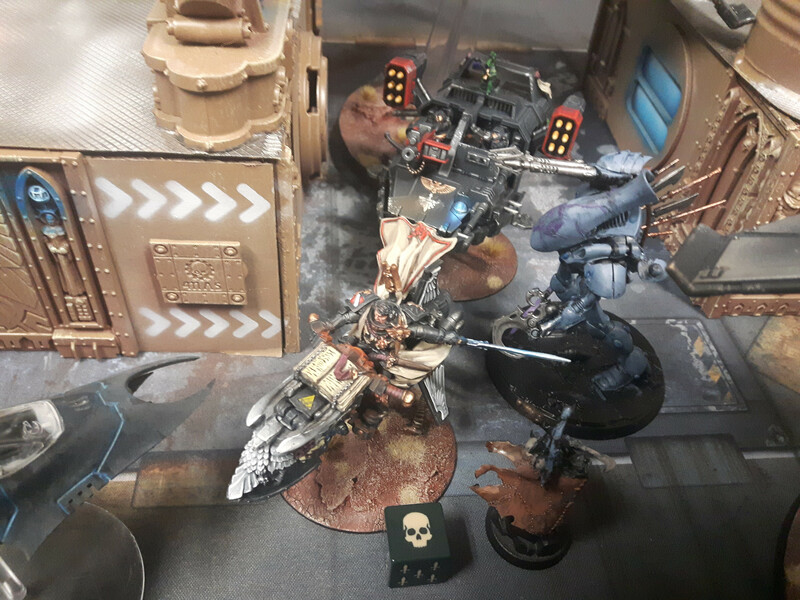 With a Land Speeder and three aircraft flying at his side, the Master of the Ravenwing dove down into the heart of the Drukhari raid. Further back, one squad of Intercessors also seized the initiative, running forwards to seize one of the objective strongpoints. The Aggressors also advanced forward, ready to bring their boltstorm cannons into range soon. And then, the darkness of the void was split asunder as roiling balls of plasma, streaming yellow flashes of bolter fire and streaking missiles burst into light. The nearest Raider was quickly wrecked by plasma fire, sending the Kabalite Warriors and the two Archons they had been attending tumbling onto the deck of the station, one of the Warriors perishing in the crash. 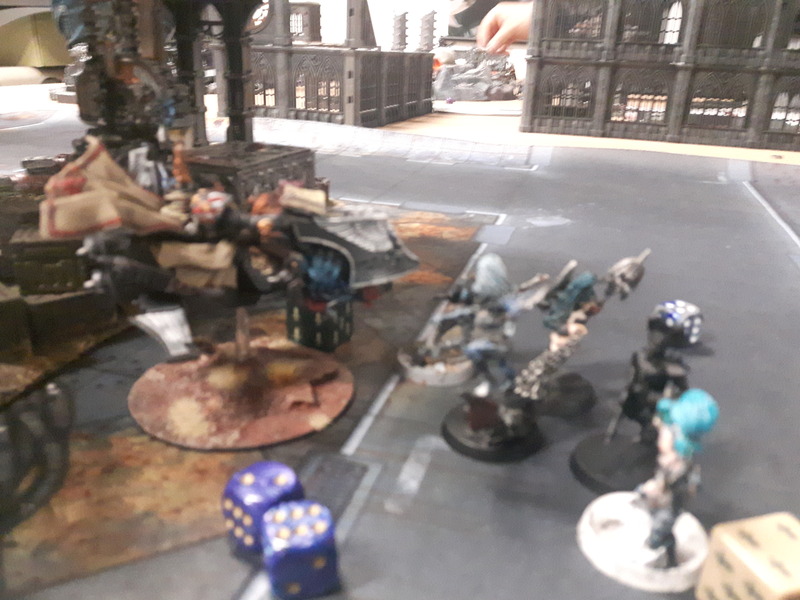 The Drukhari then came under intense fire: hurricane bolters scythed through the Kabalites, shredding them all in a matter of seconds, while a shield-breaking round punched through Khyrus’ shadow field, slamming into his shoulder and wounding him. To add insult to injury, the distant Dark Angels Scouts sniped at Khyrus as well, disabling his shadow field and wounding him a second time! Bleeding heavily, the Archon seethed in rage at the Astartes and vowed to make them bleed in turn. The Dark Angels, however, were not yet done punishing the Drukhari. Massed heavy bolter fire swatted one of the Reaver Jetbikes from the sky, before all three aircraft focused their fire on the disintegrator-armed Ravager. Despite the Lightning-Fast Reflexes of the pilot, the nimble skimmer was gutted by lascannons, Blacksword missiles and a Rift cannon shot and was reduced to free-floating debris. In response, the Drukhari craft scrambled, clustering in the centre and left flanks of the battlefield, trying to evade the Ravenwing and bring their own guns to bear upon the Dark Angels fighters: although it was essential that they sabotage the generators of this station, Khyrus knew they could not do so with these fighters menacing them. The three Talos also advanced, ready to lend their macro-scalpels to the fray against the Dark Angels. 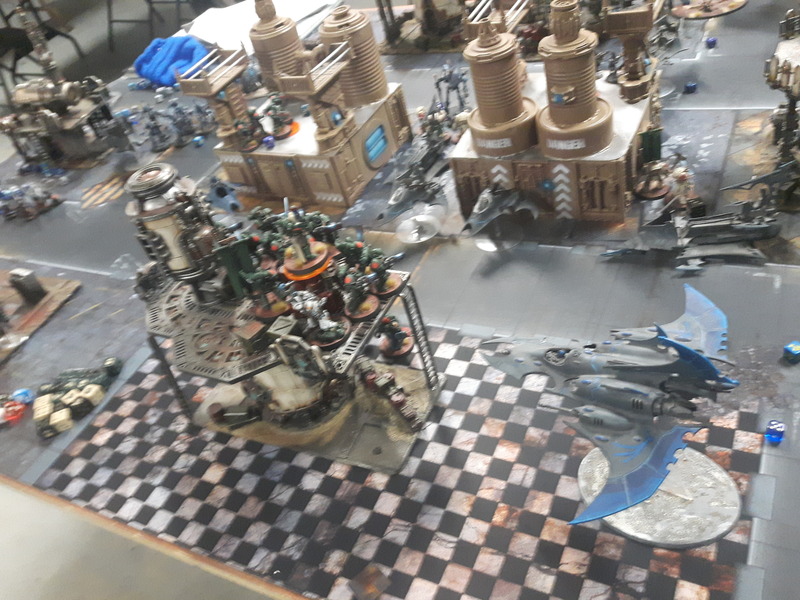 On the far left flank, the Razorwing flew around to bring its missiles to bear upon the Hellblasters, while in the centre the Reaver Jetbikes flew past the Ravenwing, eager to test their bladevanes on the Intercessors. Last but by no means least, Khyrus drew his Djinn Blade and strode towards Sammael, eager to test his mettle against the Ravenwing Master. 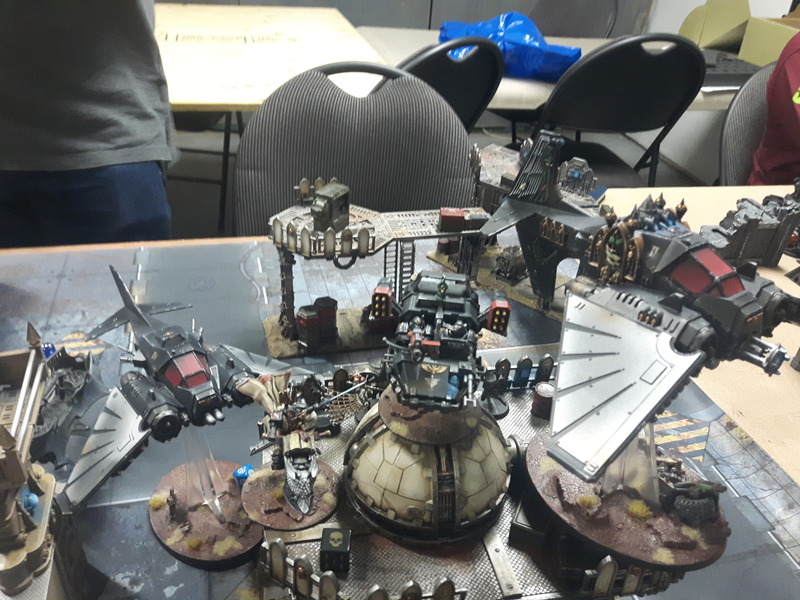 The Drukhari quickly unleashed a blistering volley of their own, splinters, darklight, and haywire blasts lashing out at the Dark Angels flyers. Combined blaster and lance fire from the Venom-mounted Kabalite squads and one of the Ravagers speared through the hull of one Nephilim, obliterating it it in the blink of an eye. The other Nephilim took damage from haywire blasts from the Talos, but the other Ravager, despite their eagerness to prove themselves Masters of the Shadowed Sky, failed to hit or damage the nimble craft. (Note: I used Master of the Shadowed Sky on the Ravager, but only scored one hit, and rolled a 1 to wound. I used a command point to reroll it…and got another 1! Argh! )Both of the Wych Raiders tried to add to the fire with their disintegrators, but neither could land any hits on their targets. Finally, Khyrus tried to take Sammael out with an opportunistic shot from his blast pistol, but the force field of the Dark Angel’s iron halo absorbed the hit. 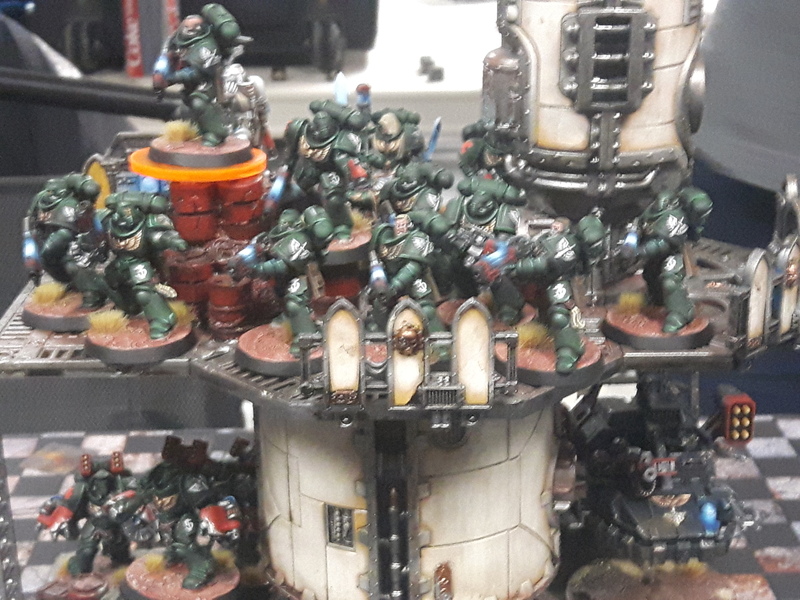 Elsewhere, the Razorwing swooped down, unleashing a screaming barrage of missiles and disintegrator blasts upon the Hellblasters…but after the detonations cleared, the Dark Angels were left completely unscathed, the force field thrown up by the Lion Helm keeping the Primaris Marines safe. With the shrieks of entrapped souls, the Talos charged, with the corrupted Wraithlord shrugging off plasma fire as it barrelled into Sammael, and Khyrus sprinting in alongside it to confront Sammael personally. Khyrus’ Djinn Blade was a blur as he slashed out at Sammael, dealing him three grievous wounds, before the Talos’ corrupted wraith-blade hacked into him and wounded him twice more. Wounded almost unto death, Sammael nonetheless fought back, and drove the Raven Sword through Khyrus’ chest, felling the Archon with one blow. Elsewhere, the other Talos hovered upwards at the surprised Nephilim, tearing chunks out of its wings with its macroscalpels and forcing the surprised pilot to evade. Finally, the Reavers came swooping down on the Intercessors, though one of the jetbikes was damaged by bolter fire on the way down. The Reavers slashed into the Intercessors, slicing apart one of the Astartes with their bladevanes, though one Reaver was killed in return as an Intercessor slammed his elbow into the rider’s throat as he passed, pulverizing his spine. 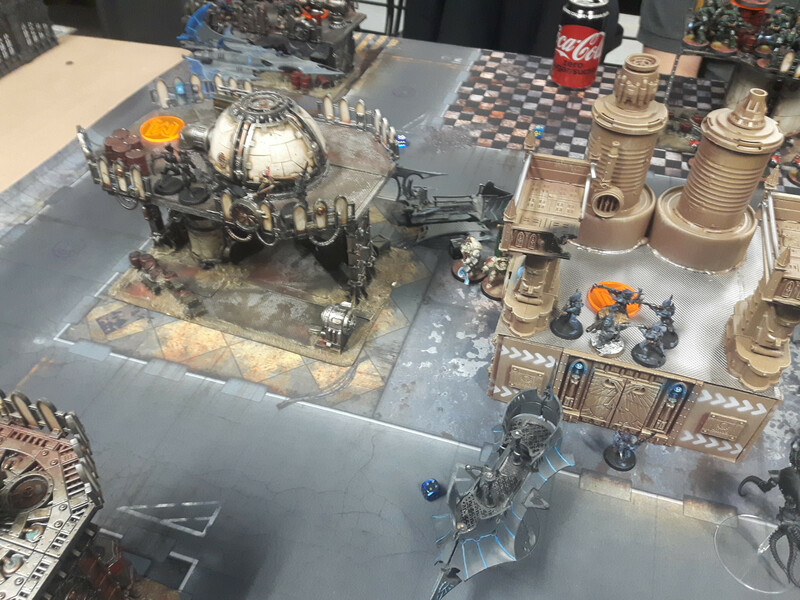 Seeing the danger of allowing his forces to linger in combat with the Haemonculi’s Pain Engines, Sammael withdrew from his fight against the Talos, while the Nephilim did the same. 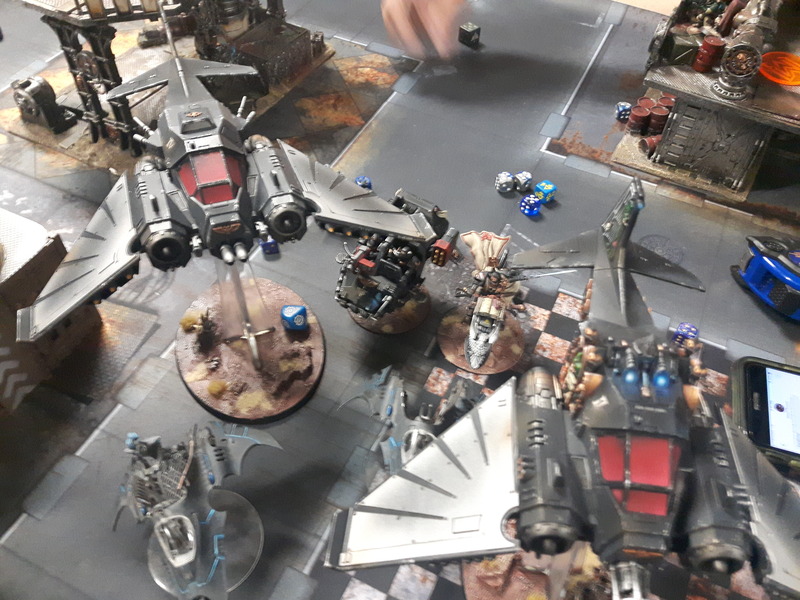 As one, the assembled Ravenwing aircraft flew downwards to threaten the rear of the Drukhari forces. Further towards the centre of the field, the Intercessors similarly fell back, wanting to put as much distance between themselves and the blades of the Reavers as possible. The main force of the Dark Angels, however, held their ground with their usual grim resolve. At that moment, lightning crackled, and five Terminators in the bone-coloured armour of the Deathwing materialized onto the deck of the station, while further on the left flank, two heroes of their order– a halberd-wielding Champion and an Ancient carrying their sacred banner– teleported into the fray as well. 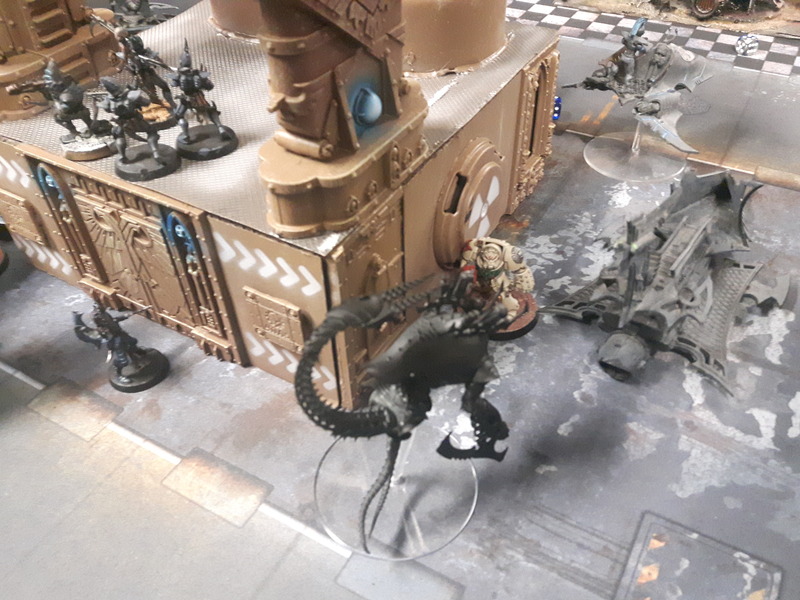 No sooner had they materialized when the Deathwing struck (thanks to the Deathing Strike stratagem), firing their weapons into the Wraith-Talos, their storm bolter and assault cannon rounds chipping off degraded wraithbone but otherwise scoring no wounds on the freakish abomination. 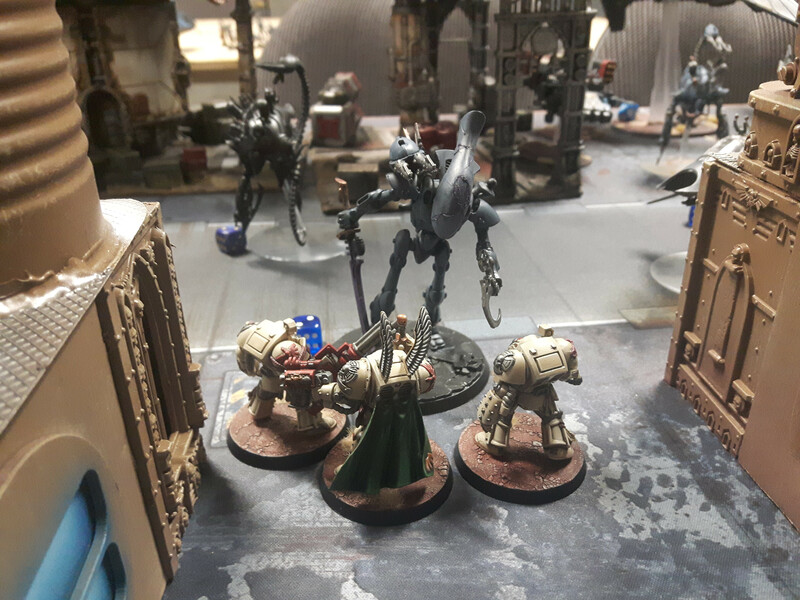 Knowing that they had to stop the Drukhari advance at all costs, the Deathwing charged into the Wraith-Talos. Power fists and thunder hammers slammed home again and again on its wraithbone hide, dealing two wounds to the fell beast. In exchange, however, the twitching Talos lashed out with its corrupted wraithsword, cleaving through two of the Deathwing and making a mockery of their ancient Terminator armour. Elsewhere, both the Deathwing Champion and the Ancient tried to charge the closest Raider full of Wyches. Not only did they both fall short in their charges, however, but the Champion took a disintegrator bolt to the chest in the process, taking two wounds and staggering as he clutched the burnt hole in his armour. Knowing that they had to start destroying generators as quickly as possible, one small squad of Wyches disembarked from the leftmost Raider and leapt acrobatically into one of the generator buildings– not nimbly enough, sadly, to get to the center to plant their bombs. A squad of Kabalites, meanwhile, did the same, disembarking from their Venom to clamber onto the roof of another generator building. 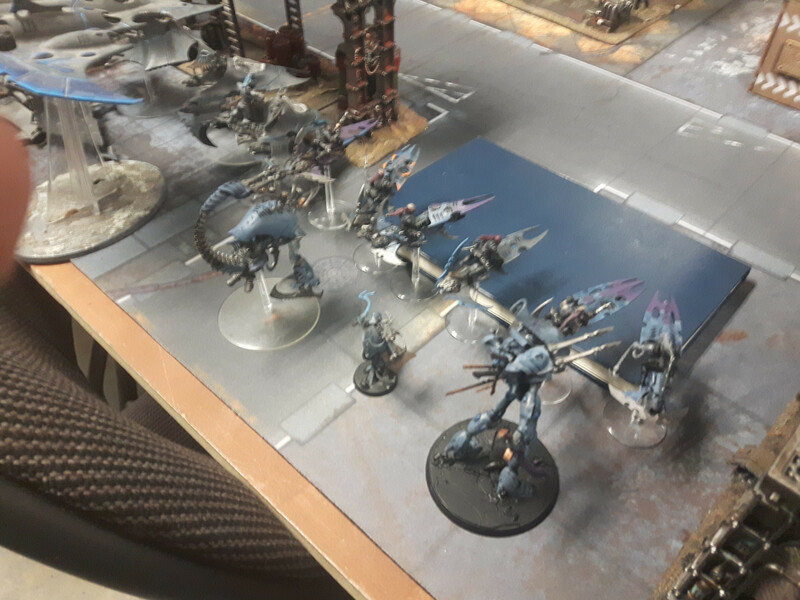 The rest of the Drukhari forces went for the kill, with all of their transports and the Razorwing flying forwards to encircle the central generator and bring their guns to bear on the hated Hellblasters. 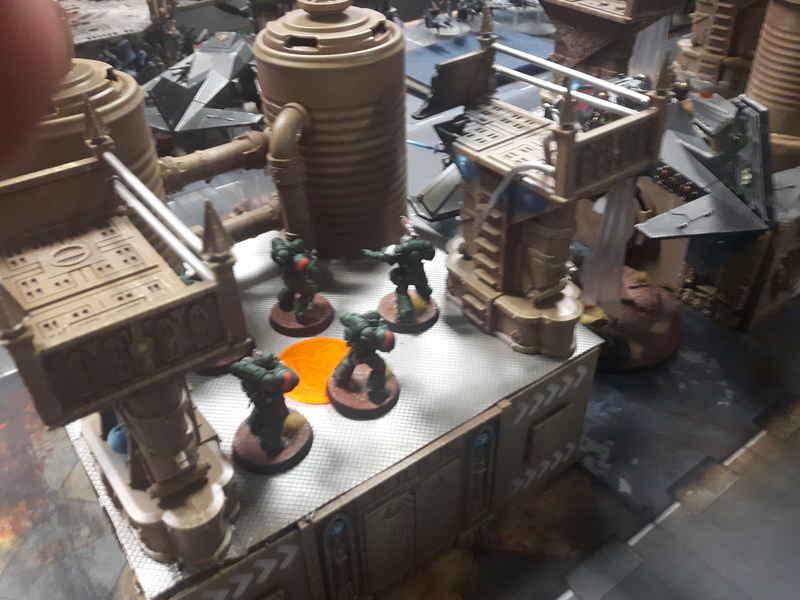 Given how heavily the Dark Angels were defending this bastion, Arvaneq figured that this must be the building that they had to demolish in order to disable the station. 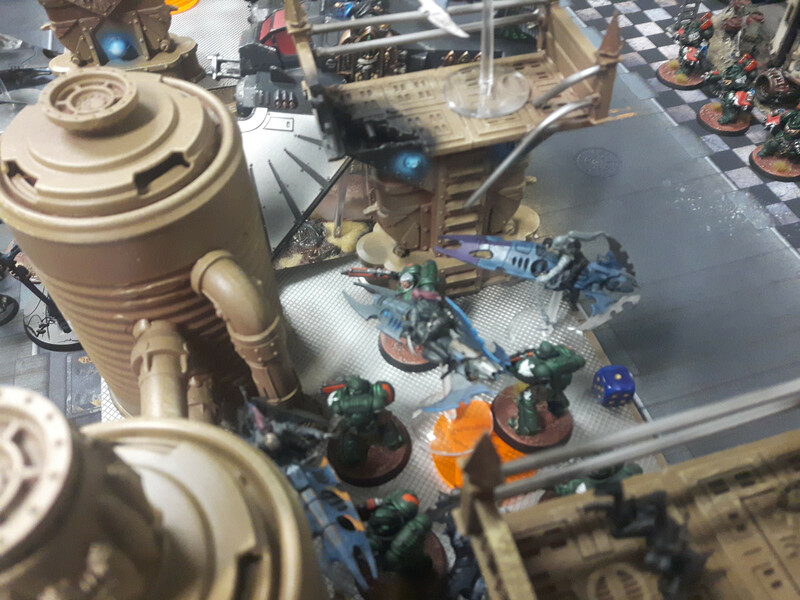 Further to the rear of the battlefield, one of the Talos hovered towards the central combat against the Deathwing, while the other floated back to deal with the Dark Angels aircraft, the Ravagers swinging around to target them as well. Finally, the last Reaver gunned his engines and shot across the battlefield, aiming to tie up the other squad of Intercessors in combat. 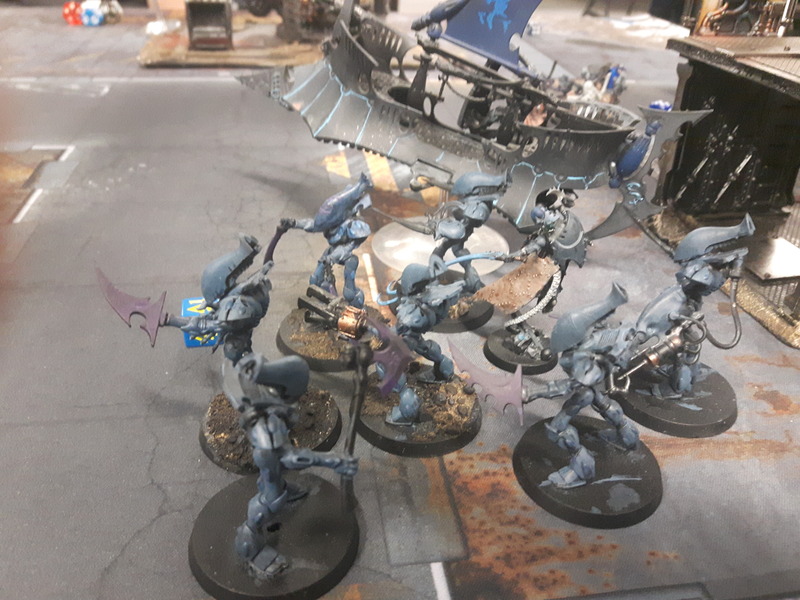 Nearby, a webway portal opened, and the Haemonculus Lazhareq stepped out, accompanied by seven of his Grotesques– twisted constructs fashioned from re-purposed Wraithguard, the souls within driven insane by torment. (Note: given how little space I had to bring in my Grotesques, I was faced with a difficult choice– bring them in within 9″ in front of the Hellblasters and risk being shot to pieces by them thanks to their Auspex stratagem, or deploy them further back with the central building obscuring line of sight to most of them. I chose the latter, hoping that the Grotesques would still move far enough to get to the central objective on turn 4 or, more likely, 5. This would prove to be a costly mistake). As the Drukhari craft swarmed around the rearmost generator-bastion, they unleashed hell, splinters, missiles and bursts of darklight raining down on the Sons of the Lion. The Aggressors were obliterated where they stood, annihilated by lances or else riddled with poisoned shards. The Hellblasters, however, were protected by a force field generated by the Lion Helm itself, and stood firmly against the dark hail. 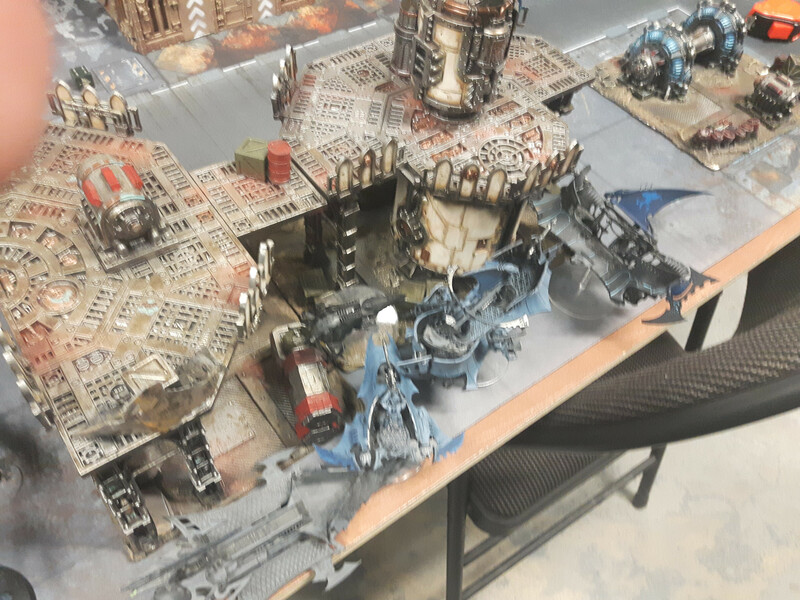 When the fusillade subsided, only four of the Hellblasters had fallen– and, inspired by the banner carried by their Ancient, they managed to fire back even as they fell, scoring several hits on the Razorwing and inflicting terrible damage on it, leaving it on only three wounds remaining! Meanwhile, the Kabalites aboard one of the Venoms fired on the centre-most Intercessors, vaporizing one of the Primaris Marines with their blaster, while the Mandrakes raised their hands and unleashed baleblasts up at the rightmost Intercessors, incinerating one of them and sending his coldly-burning corpse tumbling out into the void. Further at the back of the Drukhari lines, the Ravagers, Taloi and the disembarked Warriors focused their fire on the last Nephilim, scoring several hits with their lances and haywire blasts and leaving it on four wounds remaining. Shrieking, the lowermost Talos hurtled upwards, attacking both the Nephilim and Sammael, though it it was wounded by plasma fire on the way in. Its macro-scalpels ripped into the Dark Angel craft’s hull, dealing two wounds to it, but in response Sammael lashed out with the Raven Sword, hacking off one of the Talos’ weapon-arms, then the other, before driving his blade into the thing’s armoured carapace. The Talos shrieked and flailed, before finally falling still, slain by the Ravenwing Master. The third Talos, meanwhile, charged into the fray to aid the Wraith-Talos against the Deathwing. Between the two of them, another two Terminators fell, though the last one fought on valiantly and smashed another wound off of the Wraith-Talos with his power fist. Finally, the last Reaver hurtled into the Intercessors, striking from below the building they were on to avoid their overwatch. One Intercessor was wounded by the Reaver’s grav-talons, though a clubbing rifle-blow injured the rider in return. With one building firmly under their control, the disembarked Kabalites used their demolition charges to destroy the strongpoint. With the Talos dealt with, Sammael and his air wing flew around up the left flank of the battlefield, ready to hit the Drukhari from behind. The last of the Deathwing fell back, while the Deathwing Champion hefted his halberd and swung around one of the buildings, seeking xenos to kill. The Deathwing Ancient, similarly, strode back towards the Hellblasters’ firebase, ready to lend his hammer to the fray. Back in the central firebase, the Primaris Apothecary managed to bring one Hellblaster back to his feet, momentarily curing him of the poison shards he had been riddled with. Everywhere else, however, the Dark Angels held their ground. 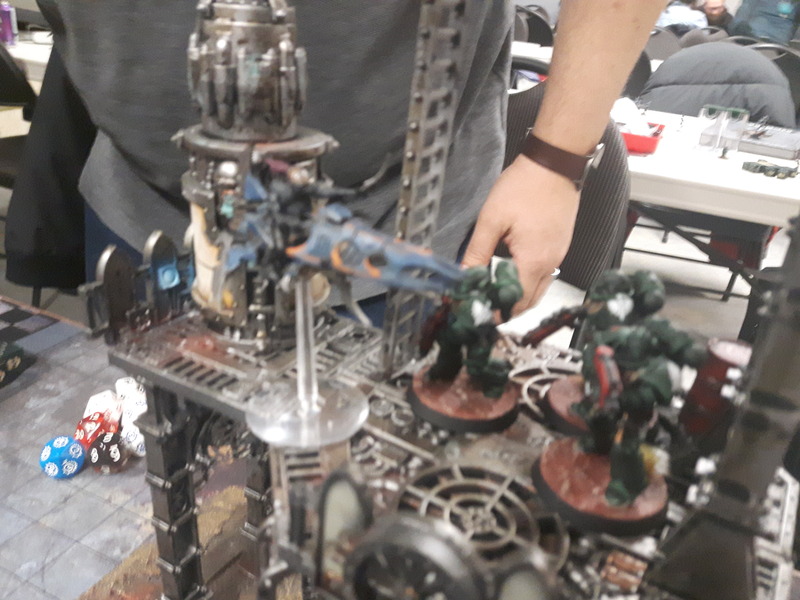 Once again, under Azrael’s direction, the Hellblasters opened fire: the Razorwing was obliterated by an overcharged plasma pistol shot from the Lieutenant, while the rightmost Wych Raider took heavy damage and was left with three wounds remaining. The Wraith-Talos took several plasma-bursts to its carapace, and burst apart in a shower of escaping soul-matter, while the other Talos also took heavy damage as well, and was left on but one wound remaining, its carapace scorched black by heavy plasma. 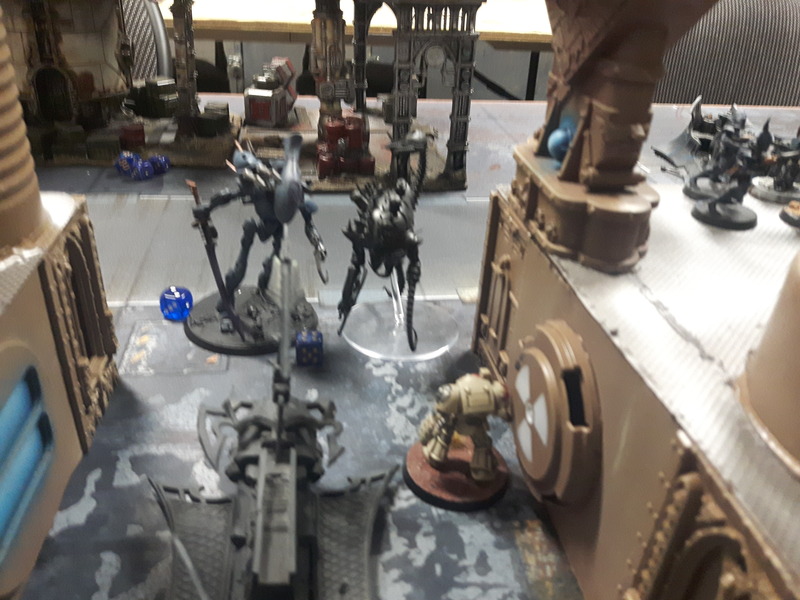 The central Intercessor squad fired down into the Grotesques and did two wounds to one of them, while the Vindicare Assassin took aim at Lazhareq and dealt one wound to him. As an encore, the engaged squad of Intercessors turned their pistols on the last Reaver and blasted him down. 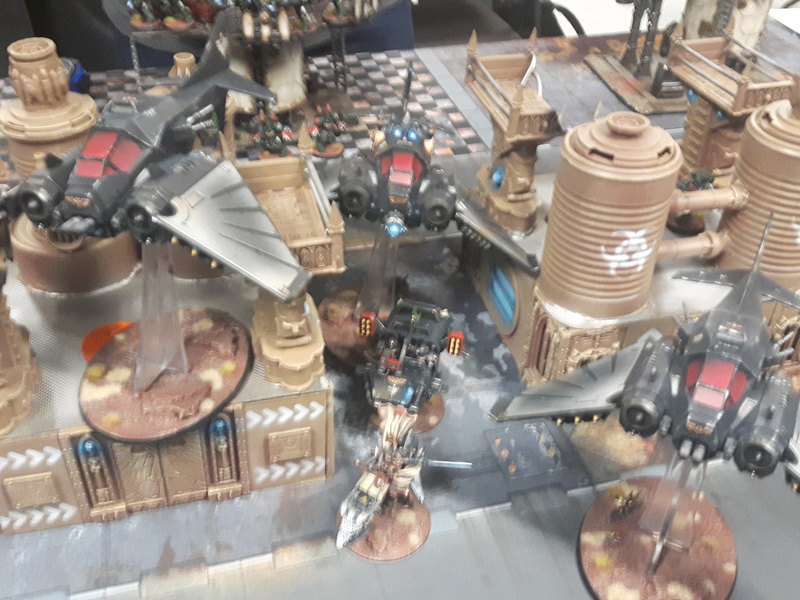 On the left flank, the Ravenwing and the Scouts let fly on the unsuspecting Drukhari: the Wyches trying to blow up the leftmost generator were shredded by hurricane bolters, while lascannons, missiles and rift cannons gutted the Raider, sending it crashing to the deck of the station. One Wych was killed in the crash, while the rest of the squad and Nyxera were forced out into the open. (Note: the Succubus actually should not have been there. Both of my Succubi were in my other Wych Raider, as the leftmost one had no room left for any characters to join, but I had completely forgotten this when I was bailing the squad out. As such, I had a Succubus on the field when I really should not have). Hefting his halberd, the Deathwing Champion charged Arvaneq, who had been directing the fire of the Ravagers. For all of his fury, however, the Champion could not pierce Arvaneq’s shadow field, while Arvaneq’s venom blade, in turn, scraped harmlessly against his foe’s Terminator plate. The Deathwing Ancient, meanwhile, charged two of the Venoms encircling the firebase, shrugging off of their splinter fire as he charged in and smashing three wounds off of one of the Venoms with his crackling thunder hammer. Finally, Sammael swooped down upon the stranded Wyches, the Raven Sword disemboweling one of the Eldar gladiators. Nyxera and her Wyches sliced into Sammael in return with their wicked blades, but none could pierce his armour– try as they might, none could fell the already wounded Master of the Ravenwing. In response, Arvaneq disengaged from combat with the Deathwing Champion, wagging a mocking finger at the mon-keigh as he did so. 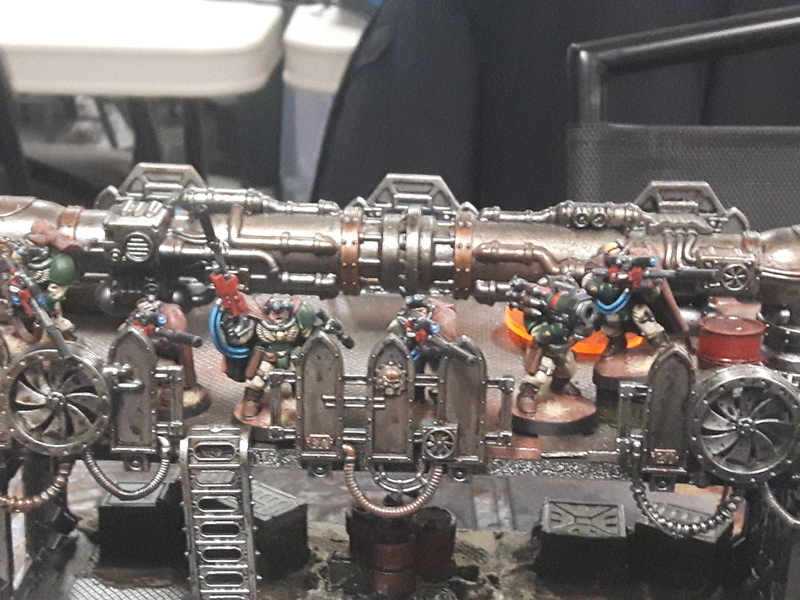 The Drukhari vehicles continued to circle the Dark Angels firebase, with a squad of Kabalite Warriors disembarking from their damaged Venom to bring their blaster to bear. More importantly, Karath and her own Wyches disembarked and sprinted forwards, readying themselves to bring their blades to bear against the Hellblasters. The Mandrakes and Grotesques continued to make their way across the field, though Lazhareq separated from his creations to go deal with those irritating Intercessors in the centre of the battlefield. Last but not least, the last Talos, despite being heavily damaged, hovered after the last of the Deathwing, hungering for his pain. Once again, the Mandrakes unleashed unholy bale-flame up at the Intercessors, searing down one of the Dark Angels and wounding another. The Talos fired its haywire blasters at the last Terminator, to no effect. One of the Ravagers tried to bring down the Nephilim, but failed to hit the swift-winged jet fighter. Everything else fired into the Hellblasters: once again, four of the Primaris Marines fell to massed splinter and darklight fire, while another was left grievously wounded. Even in death, however, the Dark Angels took inspiration from their banner and fired back at the foe: seven of the Wyches were incinerated by plasma fire as they charged across the field, leaving only a very shocked Hekatrix and Karath standing. Realizing that the two of them could not take on the remaining Hellblasters, the three Astartes heroes and Azrael by themselves, Karath and her Hekatrix begrudgingly turned and charged at the nearest available foe– the Deathwing Ancient. For all of their skill, however, Karath’s glaive and the Hekatrix’s agonizer simply rebounded again and again from the Dark Angel’s storm shield, though they managed to evade his hammer-blows in return. Elsewhere, Lazhareq charged into the central squad of Intercessors, the sub-sonic pulses emitted by his mask numbing the Dark Angels and preventing them from shooting him as he charged in. Their hesitation cost them, as Lazhareq’s electrocorrosive whip lashed out, paralyzing two of the Astartes in the blink of an eye. 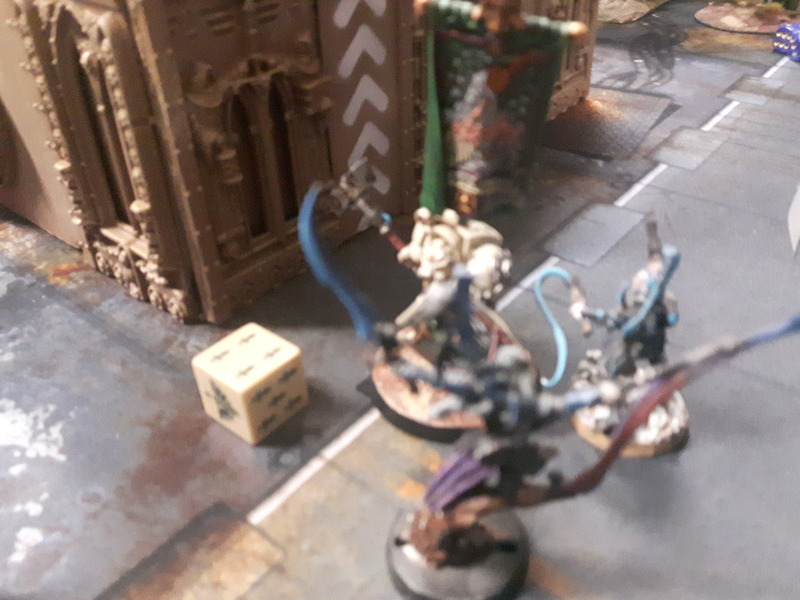 The last Intercessor fought bravely, however, and knifed a wound off of Lazhareq in return, though the Haemonculus did not seem to notice. Further in the centre of the field, the last Talos lunged upon the last Terminator, and messily rended him apart with its macro-scalpels. Further on the left flank, the melee continued: try as she might, Nyxera could not pierce Sammael’s armour, and in exchange, Sammael hacked down the last three Wyches in a dizzying display of swordsmanship. 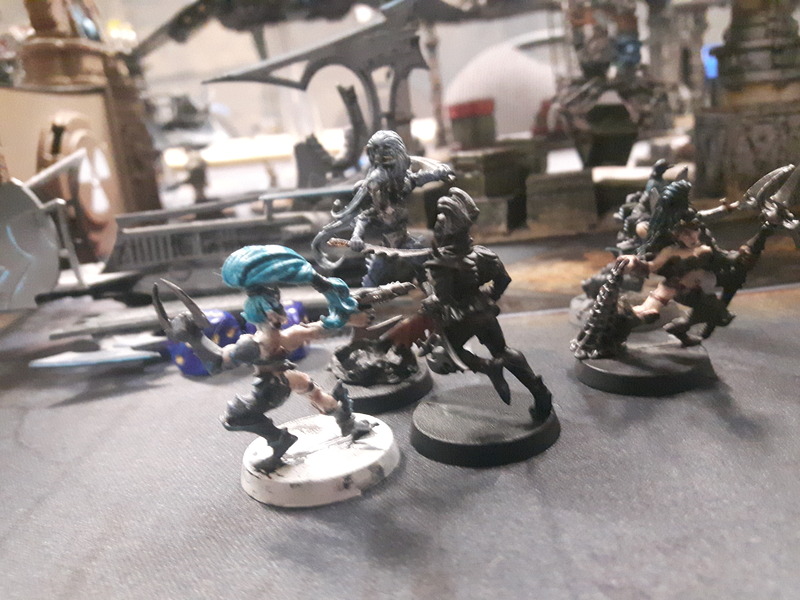 At this point in the battle, however, the morale of the Drukhari began to waver: still shocked by the loss of her entire squad, the last Hekatrix turned and ran from the melee, despite Karath’s screamed threats as she duelled the Ancient. Knowing that he could not afford to linger in combat against this xenos, Sammael flew out of melee with Nyxera, the ignoring the Succubus’ taunts as he and his attendant warplanes dove in on the flank of the Drukhari raid. 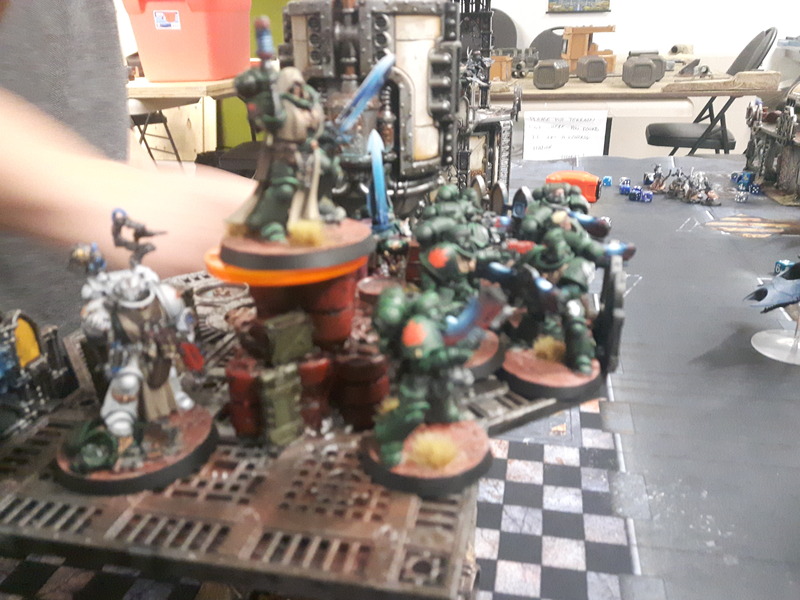 Once again, the Primaris Apothecary attended to the Hellblasters, healing the one wounded battle-brother as the squad once again steadied themselves and charged up their guns. Further back, the Deathwing Champion, witnessing the death of the last Terminator, roared in fury and advanced on the Talos, eager to avenge his fallen brothers. 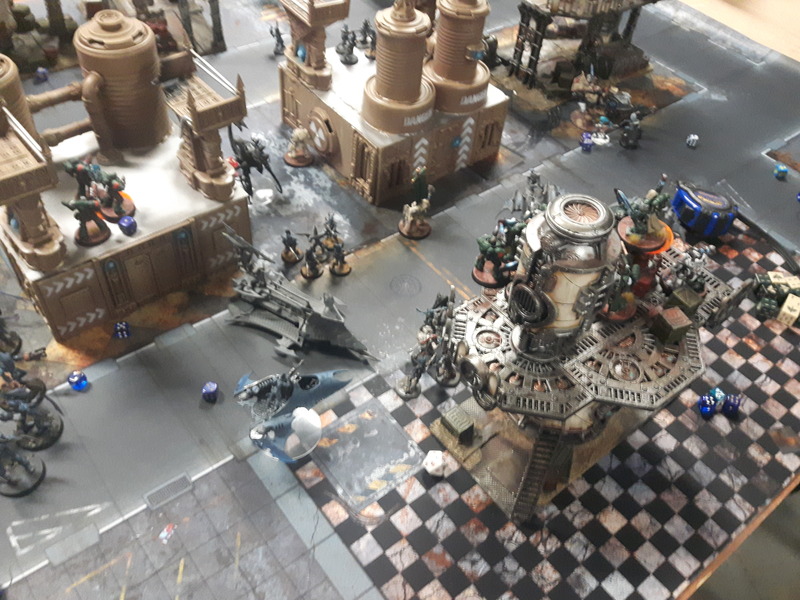 Once again, the void was lit up by plasma, but this time the Drukhari craft found themselves caught in a crossfire between the Hellblasters on the bastion and the guns of the Ravenwing swooping down on their flank. The empty Venom was quickly annihilated by plasma fire, as was one of the Grotesques. The recently-disembarked Kabalite Warriors, meanwhile, were shredded by hurricane bolters, and the heavily damaged Wych Raider was brought down by the lascannons and missiles of the Nephilim. The Intercessors also fired on the incoming Mandrakes, but failed to hit the shadow-shrouded fiends. 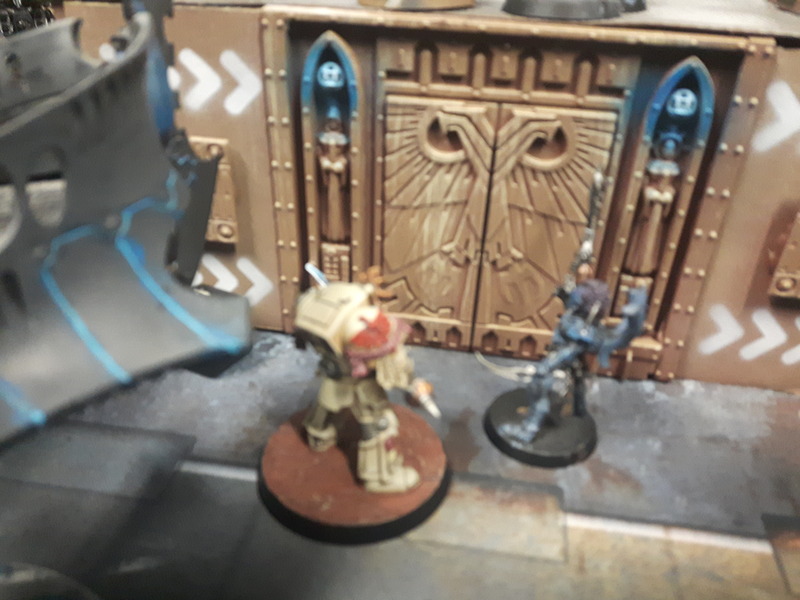 Finally, the last Intercessor in combat with Lazhareq fired his bolt pistol at the Haemonculus, but failed to inflict any damage on the fiend. Everywhere else, however, the Drukhari raiding force seemed to be crumbling under the Astartes’ relentless firepower. Raising his glaive, the Deathwing Champion invoked the name of the Lion and charged the Talos…and took several haywire bolts to the chest on overwatch. By some miracle, the Talos’ wild fire bypassed the Champion’s armour completely, and he screamed, electric currents roasting his flesh beneath his Terminator plate as he fell, twitching. Elsewhere, Karath continued her duel against the Ancient. The Dark Angel’s hammer swung in at a sudden low angle, and Karath was too late to dodge, taking 3 wounds as the hammer caught her a devastating glancing blow. Karath was still moving, though, and managed to slash her glaive past her opponent’s shield in reply, doing 2 wounds back. 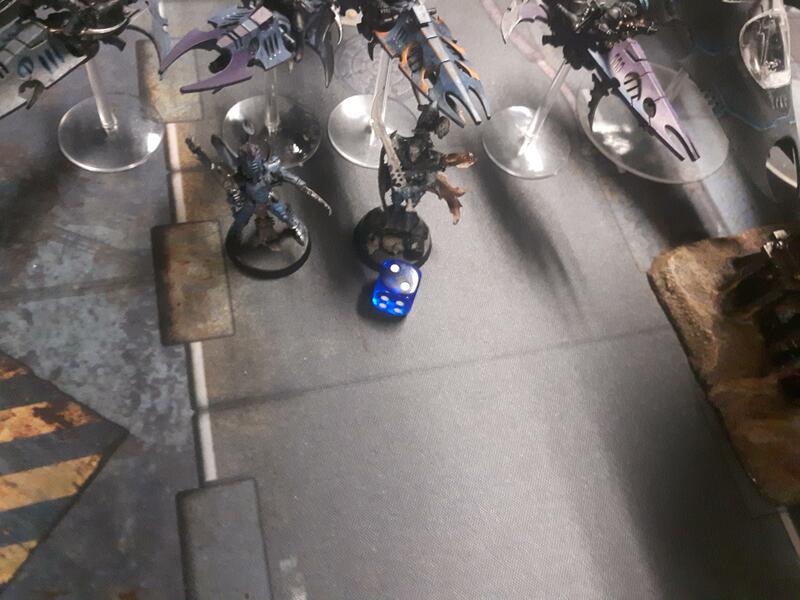 Finally, Lazhareq felled the Intercessor he was fighting, paralyzing the Dark Angel with his electrocorrosive whip and binding him for later study. At this point, the situation had grown desperate. The Ravagers flew up to pursue the Ravenwing, while the last Talos hovered forward to lend its claws to the fray. 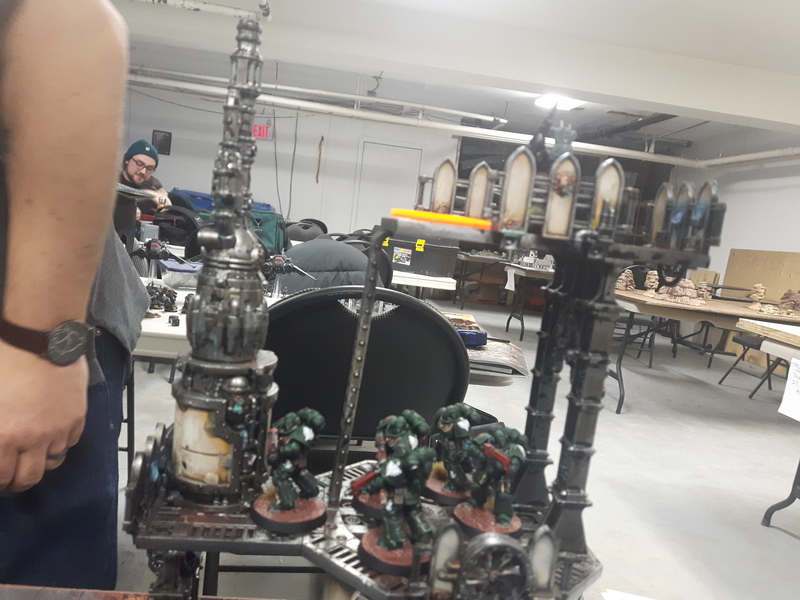 The Mandrakes crawled up onto the tower to engage the Intercessors, and more importantly, the Grotesques lumbered towards the Dark Angels firebase, ready to bring their axes, scalpels and blades to bear upon the Astartes. Nyxera, fuming that her opponent had just left her, instead sprinted over to the leftmost bastion to test her blades on the Scouts. Everything else angled to bring as many guns to bear upon the enemy as possible. 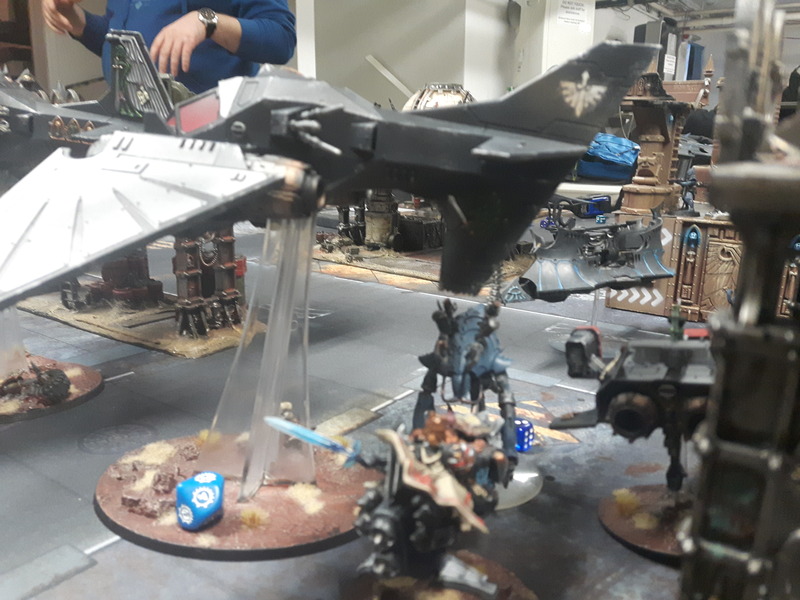 After duelling the agile Nephilim throughout the battle, the leftmost Ravager finally found its mark, landing two lance hits on the black-armoured flyer and piercing its hull, sending the Nephilim spiralling out of control and crashing explosively into a control tower. The other Ravager, similarly, manged to find its mark, obliterating the Land Speeder with two direct hits that cored the nimble skimmer like an apple. Finally, the Ravenwing were starting to fall, though at this point it may have been too little too late. 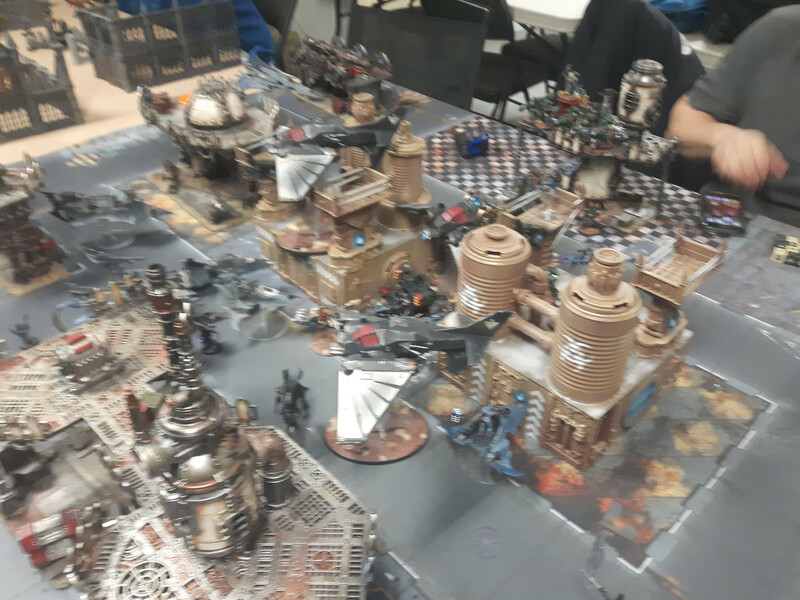 Everywhere else, the massed guns of the Drukhari rained down upon the Hellblasters. 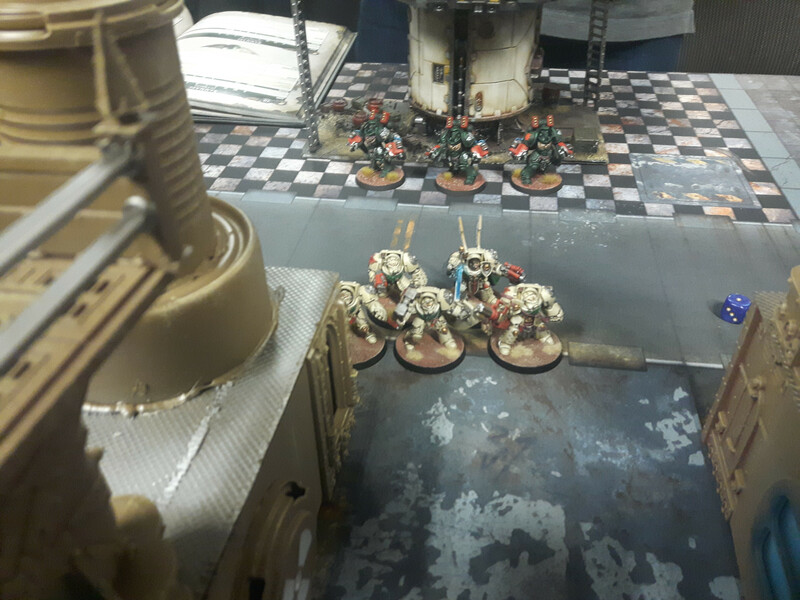 Three more of the Primaris Marines fell, leaving only one left standing, and this time, none of them found the strength to fire back in death. Finally, the Mandrakes unleashed their baleblasts, felling yet another of the Intercessors with cold flame. Raising their serrated blades, the hissing Mandrakes charged up the tower at the Intercessors, ghosting through their overwatch before closing with them and hacking both them them to bloody pieces in the blink of an eye. The Talos, meanwhile, dove into the melee between Karath and the Ancient, overwhelming the surprised Dark Angel and bisecting him with its macro-scalpels. Karath was left only to pout that the pain engine had just robbed her of a kill. Nyxera, meanwhile, charged the Scouts…who responded by firing a frag missile, wounding the Succubus with shrapnel. Undaunted, Nyxera managed to slice down one of the Scouts, but one of them managed to wound her with his combat knife in return. 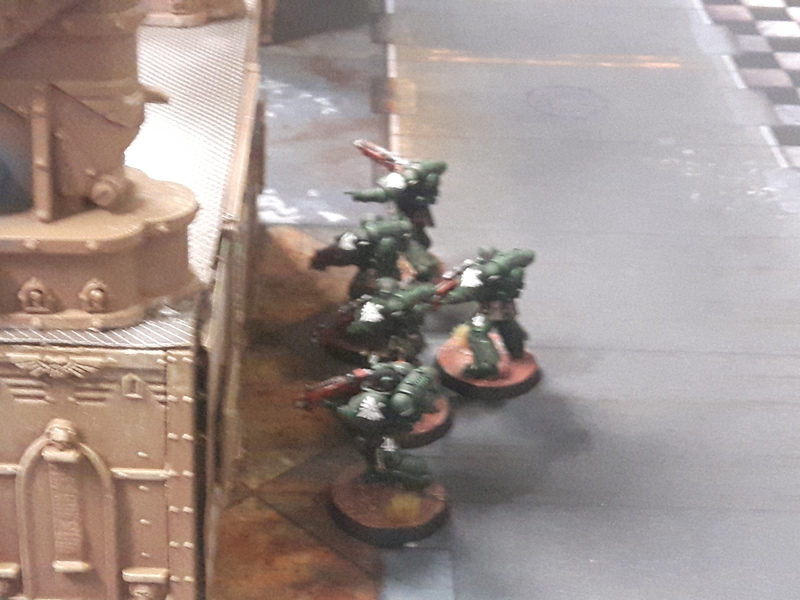 Finally, Grotesques raised their bladed arms and launched themselves into a charge at the last Hellblaster, hoping to make it up onto the building and finally engage the Dark Angels. Fate seemed to have other ideas, however, for despite their invigoration and their hunger for the pain of their enemies, the Grotesques’ charge, fell short. Now in control of one of the objectives, Lazhareq detonated it. At this point, however, it was abundantly clear that the raid had failed. Bitterly, Arvaneq signalled the withdrawal, leaving the power station of the fortress firmly in control of the Dark Angels. By this point, my opponent had to leave due to family obligations. Before he did so, he revealed that his secret objective had been the one at the back of his lines– the one that his Hellblasters and characters had been sitting on the entire time, just as I had suspected. Well that was a brutal game. There were a lot of cases where things went horribly for me, in part thanks to horrible dice rolls and in part thanks to some terrible decisions on my part, but I think I was fighting an uphill battle the moment my opponent got the first turn. By zooming his flyers right into the heart of my army, my opponent not only got off a devastating alpha strike (one that saw my warlord die an embarrassing death on Turn 1), but also put me on a back foot by forcing me to deal with his flyers immediately rather than go grab objectives. I severely underestimated the -1 to hit penalty that you get with most flyers: I didn’t think much of it at first, but after failing to roll the necessary 4+ to hit the Nephilim for several turns in a row, I found myself unable to hurt the damned things for most of the game. It wasn’t until the end of the game that I started to finally destroy some of them, and by then it was far too late. I think for the most part, I lost simply because my Phil played an excellent defence: he used his own mobility to counter mine and to force me to split my attention between his flyers and his objectives. He also was more than willing to sacrifice his units to keep me away from the objectives, and did so quite effectively. And then there was his terrifying Hellblaster death star: between the rerolls provided by Azrael and the Lieutenant, his regular use of the Relics of the Dark Age strategem making his plasma weapons Damage 3, and the Lion Helm giving them all a 4+ invulnerable save, his Hellblasters were regularly wreaking havoc on my army while reliably shrugging off my return fire. That’s to say nothing of inflicting even more damage on me in my own phase thanks to that damnable Ancient: losing most of my Wyches in my own turn before they could even charge was something of a shock to me. The fact that my Phil played Drukhari as well as Dark Angels meant that he pretty much knew how my army worked, and how to effectively fight against it. That whole embarrassment at the start of the game, where I pretty much left my warlord’s transport exposed in order to screen my Reavers. In retrospect, it really should be the Reavers who screen my Raiders, not the other way around. Looking back, I think I deployed my units too far back in an effort to stay out of range of his Hellblasters. What I should have done is deploy as far forward as possible to try to get troops onto his objectives from the very first turn. Also, I wasn’t focused enough on grabbing objectives– I used Demolitions on maybe two buildings all game. The decision to deploy my Grotesques as far back as I did was a mistake, and one that may have lost me the game. I knew that if I deployed them in 9″ of the Hellblasters, then not only would I likely not make the charge (as they would have a hefty vertical distance to go up in addition to their 9″ move), but they would also be fired on immediately by my opponent with his Auspex and Relics of the Dark Age stratagems. On average, I would most likely have lost a third or half of my Grotesques, and then would be subject to even more firepower in my opponent’s shooting phase. However, looking back, I should have landed them in 9″ anyway: even if they did get mauled by my opponent’s reactive fire, it still would have been worth the risk if I could get them into close combat. Furthermore, on my second turn, I had a lot of units ready to inflict maximum threat overload on the Hellblasters: even if my Grotesques were annihilated, they would have diverted a lot of firepower away from my transports and Wyches. Overall, though, despite my moments of idiocy, this was a fun game, and my opponent was a great guy who earned a well-deserved win. He was an amazing opponent, and I definitely look forward to facing him again. That being said, here’s hoping that I can do better in the next round of the campaign. Man of the Match: Sammael. Despite being reduced to 1 wound at the start of the battle, Sammael was almost unstoppable in this game, mowing through my warlord, a Talos and a squad of Wyches in quick succession. No matter what I threw at him, he just would not fall, and his reroll aura made his accompanying jetfighters all the more deadly in this game. Honourable nods go to Azrael, however, whose reroll aura and Lion Helm made the Hellblasters a force to be reckoned with. On my end, I nominate the last Talos, as, even though it was left on one wound, it still went on a rampage and killed off the Deathwing Champion, Deathwing Ancient and the last Terminator. At this voxed command, the Dark Angels’ guns fell silent…though out here in the airless void, they had always been so, volleys of bolt and plasma flaring silently as they lanced through the darkness. As the firestorm came to an abrupt end, Azrael watched through the orbital gloom as the Drukhari retreated, the targeting augurs of his retinal visors picking out their needle-like craft as they disappeared against the starscape, flying back upward into the void from whence they came. Behind them they left the hull of the station strewn with corpses, those of their own kin and of the Astartes, all drifting slightly in the low gravity of the space station. 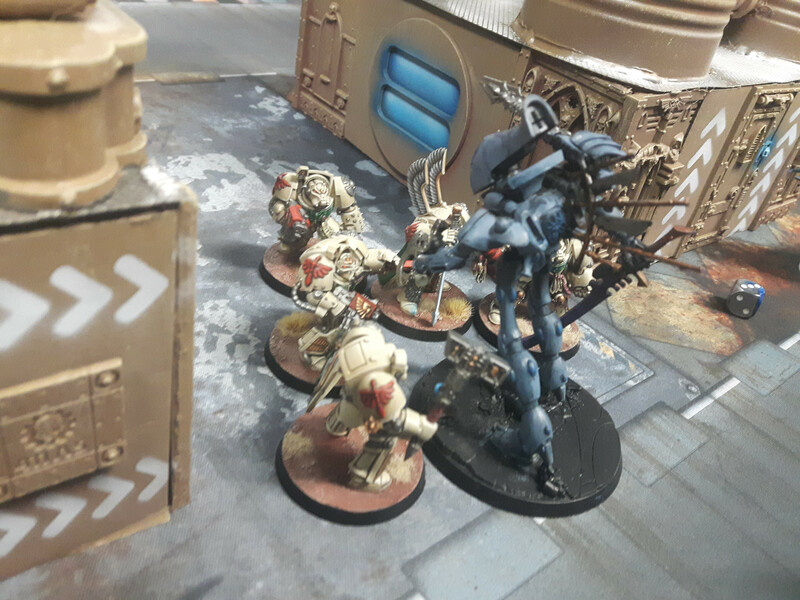 The Drukhari had sought to test the Sons of the Lion, and they had been found wanting, making the mistake of fighting Azrael on a ground of his choosing. He had given them a bloody nose that they would not soon forget. In any other circumstance, he would have taken a measure of satisfaction from so decisively defeating the xenos…but he had not come here to fight them. They had been nothing more than a distraction from his true purpose on this benighted station. 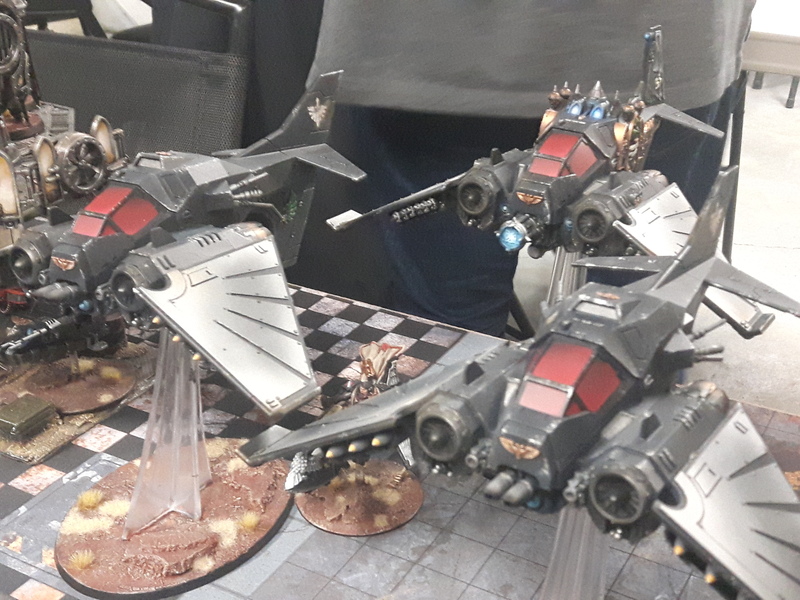 He noted the black shapes of the surviving Ravenwing craft swooping off in pursuit of the xenos cowards. “Leave them, Sammael,” he voxed. “We have better things to do than chase after beaten curs.” He heard the voxed acknowledgement of the Ravenwing’s Grand Master, and even from this distance, Azrael could see Sammael’s blade flash in a raised salute as his ancient jetbike did an elegant about turn before skimming back towards the firebase. Turning his attention back to the firebase itself, Azrael noted with distaste just how many of his newer Primaris brethren had fallen in the raid. Apothecary Micah was already busy harvesting the progenoid glands of the dead Hellblasters, the lone survivor of the squad kneeling somberly over his slain brothers. A great many Dark Angels had died this day to xenos trickery. This was supposed to have been a bloodless extraction mission, and would have been if the Drukhari had not intervened. The timeliness of the xenos attack could not be a coincidence. Azrael felt the blood drain from his face under the close confines of the Lion Helm. Slowly, he turned his gaze from the battlefield and stared outwards into the starscape. The bowl of Hod’s Anvil hung above him, so close that he felt like he could run his armoured hand across its brown continents, swat down the towers of its grey-black forge cities, trail his fingers across its vast oceans. Somewhere, on that planet, their quarry was no doubt waiting. When Khyrus awoke, it was to a terrible, cold numbness that suffused his entire body, stiffening his muscles and leaching into his bones. Pain, he was used to, but this…this biting cold, this horrible absence of feeling, was far worse than any pain he could imagine. He felt worse than dead, he felt drained, as though a part of his very essence were leaking away into oblivion. It was with a momentary burst of fear that he opened his eyes. At first, he thought he was dead, lost in some stygian underworld…until he recognized the rusted cages hanging from the ceiling, the racks of gleaming vials, and the humming, crackling generators that writhed with twisting soul-matter. He was in Lazhareq’s sub-realm, the Haemonculus’ personal oubliette, and his half-naked body was currently strapped to a gurney. Things suddenly became more clear to him. He must have died in that last raid. It had happened before, and the last time, he had ended up in here, brought back to life by the Haemonculus, a being to whom the entire Kabal owed an immeasurable debt. At that moment, Lazhareq paused, turning his expressionless helm in Khyrus’ direction as though finally noticing that he was conscious. Wordlessly, the Haemonculus stepped back. It was then that Khyrus realized there was another figure standing over him– a figure clad from head to foot in armour the colour of weather-beaten marble, its head encased in a helm of crowned, spiralling horns. “Zhael,” Khyrus breathed, his voice but a rasp. The figure leaned closer over him. He could see the beautiful,serene mask that covered her face gazing down at him with soulless contempt. “You will call me by my title, Dracon,” the Hierarch replied coldly, her own voice resonating within her helm. Before Khyrus responded, an armoured gauntlet slammed down on his torso, armoured fingers plunging through his wound to clamp down on the intestines within. At that moment, his body realized it was alive again as hot, stabbing pain lit up his belly, and a strangled scream wrenched itself from Khryus’ throat. Khryus tensed at the name. Even after all this time, it was a name that still hurt, that still reminded him that he was not a trueborn Drukhari. In any other circumstance, he would have spat blood up into Zhael’s masked face, consequences be damned. But he hadn’t risen to the rank of Dracon without knowing how to play this game. This entry was posted in Uncategorized and tagged 40k campaign, Battle Report, Dark Angels, Drukhari, Warhammer 40k. Bookmark the permalink.